Claude Ratinier (de Funès), known as Le Glaude, is an old farmer who lives across the road from his long-time friend Francis Chérasse , known as Le Bombé. The two are described as the last surviving members of their breed, still living in a rural fashion while the rest of the world has modernized. They spend their days getting drunk and eating cabbage soup, while they spend their nights getting drunk and farting. One night, their farting summons an alien from the planet Oxo while Le Bombé is asleep. Glaude is awake to welcome the alien (who can only communicate in a squealing-siren sound). He learns that the people of Oxo live to be 200 years old and lead perfect lives. Glaude sends the alien off with a canister full of cabbage soup. The next day, we find out that Bombé had seen the flying saucer, but he is dismissed by the townsfolk as a drunk. Over the course of several meetings with the alien , many things transpire. The alien arranges to have Glaude's late wife resurrected at the age of 20. She runs away to Paris with a young man within a day of her revival. He also duplicates Glaude's entire fortune of a single gold coin hundreds of times, making Glaude rich. 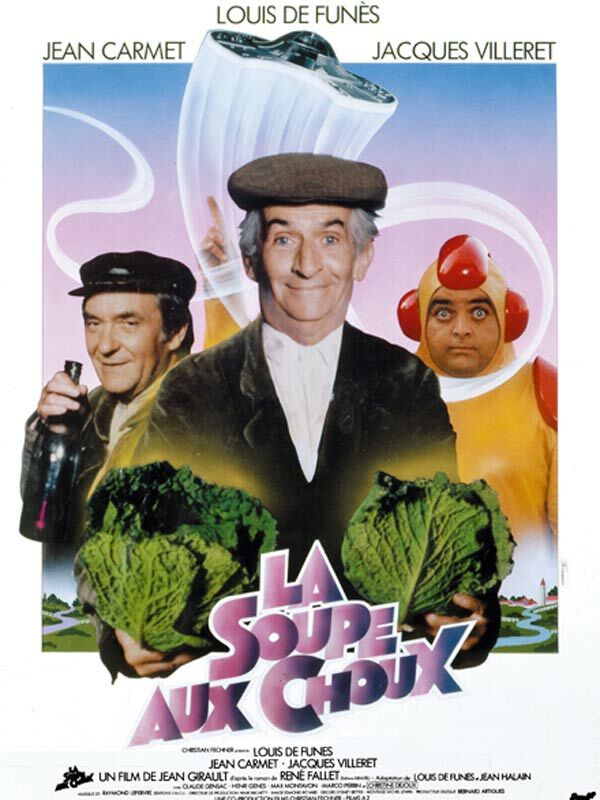 Finally , the alien offers Glaude, Bombé, and their cat residence on the utopian Oxo so that they could grow their cabbage and make cabbage soup. This would allow them all to live to the age of 200. Glaude initially rejects the proposition outright. Meanwhile, the mayor of the rural town decides to modernize. He plans a new housing project directly on the old men's land. Although he threatens to put them in a cage like monkeys, he cannot convince them to give up their land. He decides to simply build around their houses and fence them off from the rest of the neighborhood, effectively caging them in. They become a roadside attraction, with people jeering at them and throwing popcorn at them whenever they step outside of their doors. This greatly reduced quality of life convinces Glaude to accept the alien's offer. He tells Bombé about their option, who is admittedly skeptical at first, but opens up to the idea when he sees the communicator left by the alien. Before leaving, Glaude makes a last stop at the post office to send his runaway wife a package containing the gold they were given by the alien. The film ends with Glaude, Bombé, and the alien flying off into space inside the flying saucer, joyous and drinking. Whole or part of the information contained in this card come from the Wikipedia article "Kapuśniaczek", licensed under CC-BY-SA full list of contributors here.